Most diets don’t work because they restrict food intake and put inconsistent physical stress on the body, starving cells, throwing hormones out of whack, and slowing down metabolism. 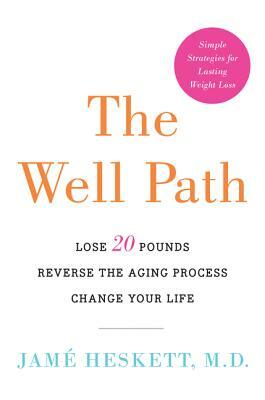 In The Well Path, Dr. Jamé Heskett offers us a radical new approach: In order to lose weight, we first have to heal the damage we’ve done to our bodies from years of dieting. Before we can lose weight for good, we need to achieve homeostasis—total balance in the body, with all its systems working in concert. When you're there, you’re full of energy, look and feel younger, and lose weight effortlessly. JAMÉ HESKETT, M.D., is the founder and medical director of the Wellpath, an anti-aging and wellness center established in 2001, located on Madison Avenue in New York City. Dr. Heskett received her M.D. from the George Washington University and completed her postgraduate residency at the Swedish Medical Center in Seattle, rounding out her medical practice with a formal education and apprenticeships in homeopathy and naturopathy, which she integrates into her practice today. She is the mother of three, a wife, a yogi, and an accomplished hiker. She lives with her family in New York City and can be found during vacations and weekends on the Appalachian Trail. Visit her at www.thewellpath.com and www.thewellpathbook.com.